FirstEnergy employees gather on Little Round Top and are inspired by a speech given there, over 150 years ago, by Col. Joshua L. Chamberlain. 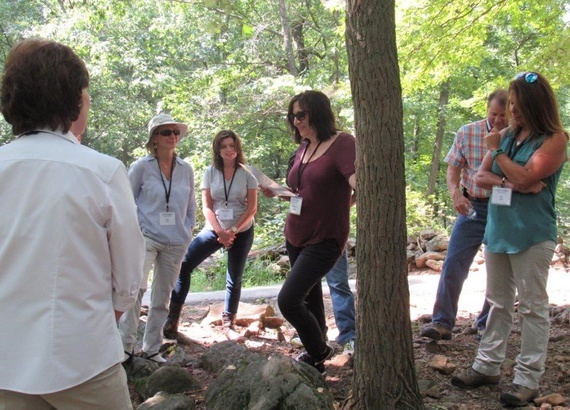 The Gettysburg Foundation’s In the Footsteps of Leaders program celebrated its most successful year to date serving nearly 50 clients across corporate, education, government, and nonprofit agencies. While obtaining several new clients, the majority of the 2017 bookings were repeat clients—proving that executives see positive results from the program. When surveyed on overall program satisfaction, 97% of clients gave their experience a 5 out of 5 rating. In the Footsteps is a unique leadership training experience because it uses the complexity of battle, the size of the opposing armies, and the wide spectrum of personalities represented on the battlefield as a case study for modern-day organizational challenges. Common leadership tactics like communication, team-building, empowerment, adaptability, strategic thinking, and accountability are just a few of the lessons tackled in the program.